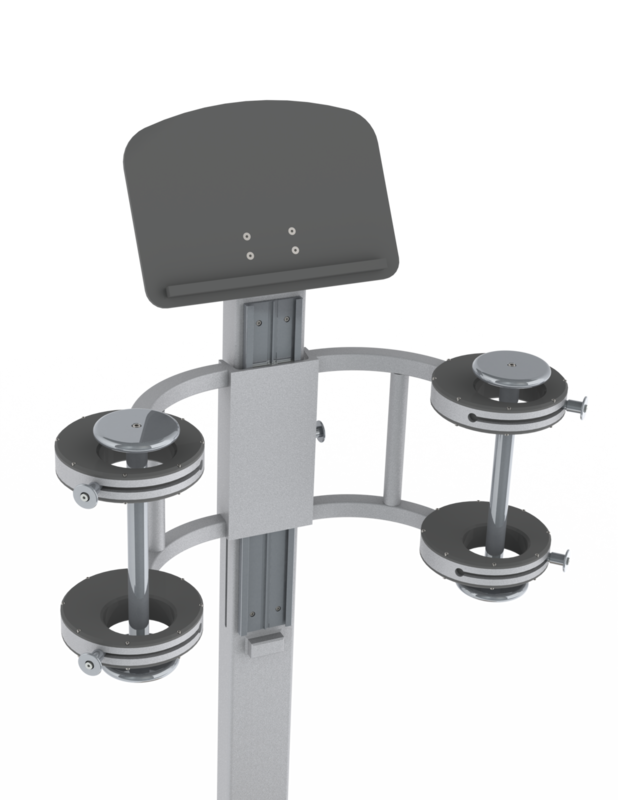 We were approached by entrepreneur and inventor, Jeff Greiwe to create the Freesway Balance Trainer for his company, BalanceMetrics. We were able to provide both the design and branding tools necessary for Jeff to turn his idea into a product that shipped and could be sold in the therapeutic market. In fact it held such a presence in the market, that Jeff sold the Freesway product to a major therapeutic equipment manufacturer and is now working on his next great ideas. The case study below addresses the Industrial Design work around the Freesway Device — for the case study on our Brand Identity work with BalanceMetrics, click here. Falls, with or without injury, carry a heavy quality of life impact. The Freesway Balance Trainer aims to safely provide seniors who are anxious about falling (or who have fallen in the past) a way to re-build their balance. Balance, like a muscle, can be trained through focused exercises with the Freesway Balance Trainer. Utilizing lightweight dumbbells that are safely captured in adjustable collars, a typically unsteady user can improve their balance through a series of exercises while holding onto the dumbbells. For example, while holding the dumbbells balanced on one foot, can you close your eyes and turn your head? Its a great test of balance, and is harder than you'd think. Should you begin to fall, the dumbbells "catch you" and you can try again, safely. Because the dumbbell handles are not attached to the holders, patients aren’t truly supported. As a result, they sway naturally and must correct their balance when the device "catches" them. Because the trainer allows the patient to experience “proprioceptive” feedback – the unconscious perception of movement and spacial orientation from stimuli in the muscles and joints – while simultaneously protecting them from falls, it enables users to practice balance exercises correctly and safely. After being approached by Mr. Greiwe and discussing the goals and intent of the project, we began with sketches that encompassed a variety of aesthetics within the functional envelope. We explored aesthetics that matched both the medical and exercise markets while staying well within the realm of feasibility for cost-effective manufacturing. After selection of Concept 4 in the Sketching Phase, we went through a round of aesthetic and functional refinement in sketch renders. The largest development during refinement came in the way of the iris-based difficulty adjuster, a key functional component of the final concept. This allowed users to grow and improve their ability to balance on a more granular level. 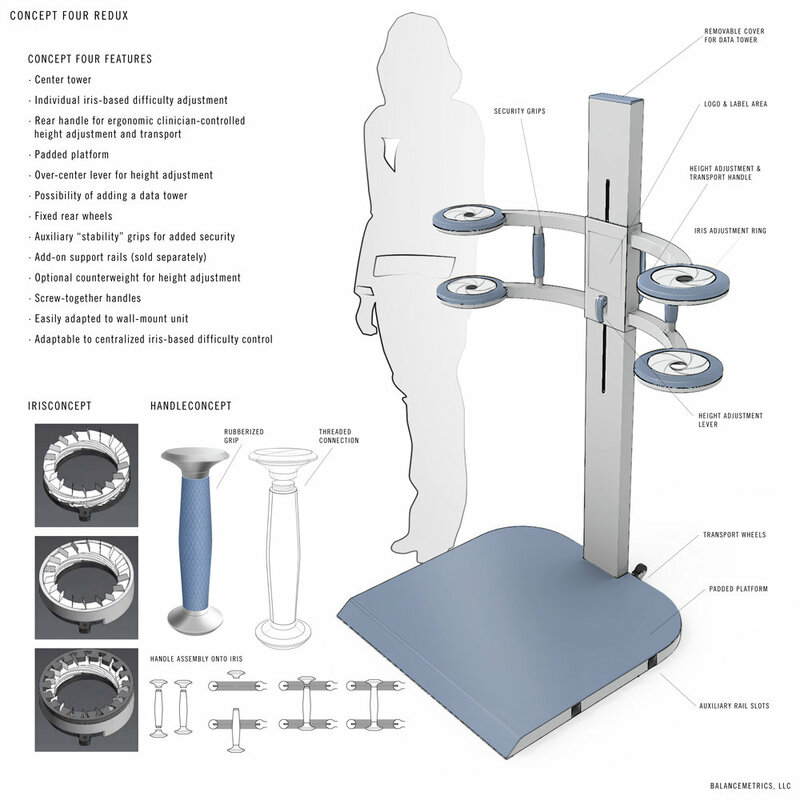 Once this sketch render was approved, this concept was translated into 3D CAD in Solidworks. After a discussion with our manufacturing partner it was refined once more — to the final product we see today. Once CAD models were design locked, the local low-volume manufacturing partner to produce looks-like/works-like prototypes of the design. Because our design was refined with an eye towards easy prototyping — using off the shelf fasteners and clever manufacturing solutions — the cost of goods was such that these prototypes were essentially the shipping product. Jeff was able to begin selling the product to nursing homes and rehabilitation centers almost immediately. With a shipping product at hand, Jeff was ready to start selling — but a brand identity and marketing was necessary to entice potential users and resellers in the competitive markets of exercise rehabilitation equipment. We worked with the client to turn BalanceMetrics into a brand that could sell not only this product, but a vision that was worth acquisition. To see how we tackled this unique brand & marketing challenge, see the case study here.